to this development originated from jazz music has been the result of the creative activity of tonal innovations; however, it is not limited to jazz music only. Any musical manifestation that remains faithful to the traditional concept of tonality can be extensively benefited from the use of modern techniques employed in tonal harmonization. The primary aims of this work have been to synthesize these techniques and to make them easily accessible to the student. 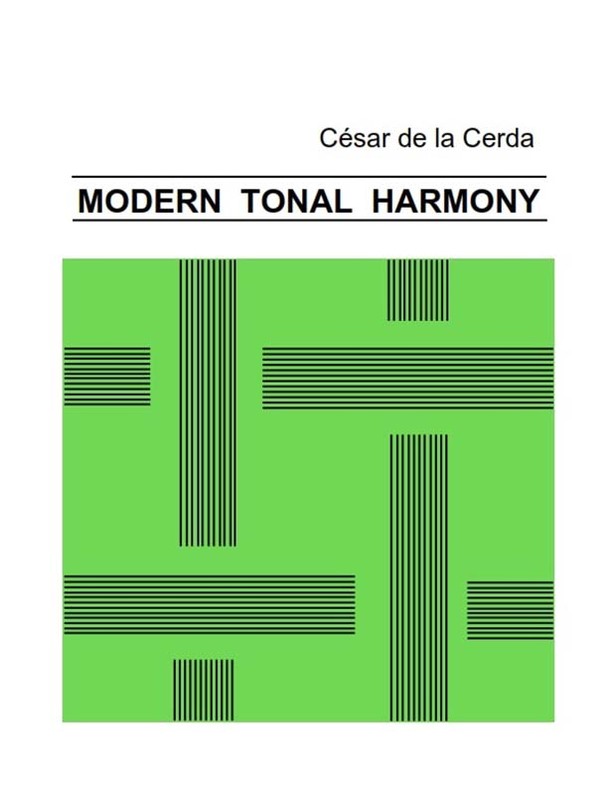 The term MODERN TONAL HARMONY is an adequate way to call the harmonic innovations given inside tonality (which is represented by the seven notes of the musical scale). In a broader sense, and beyond its generation and development into the core of impressionism and jazz music, Modern Tonal Harmony is linked to all musical manifestations from any style faithful to the major-minor system (i.e., diatonic) of traditional harmony. The book has many exercises and melodic illustrations. Modern Tonal Harmony is the best method for all musicians that want to find simple and innovative techniques to develop their creativity in modern harmony. THE CHORD: Chord Structure; Classification of Chords into Qualities; The Sixth Chord. TONALITY: The Seven Chords of Tonality; Chord Alterations. Chromatic Progression; Alternative Use of Progression; Harmonic Analysis. Variants of the Dominant Chord. SUSTITUTION OF THE DOMINANT CHORD. STATIONARY CHORDS AND PARALLEL CHORDS. REHARMONIZING HARMONIZED MELODIES: Conversion; Correction. MINOR KEYS: Relative Keys; The Triple Minor Scale; The Seven Chords of a Minor Key. MODULATION: Tonal Changes in the Course of a Melody; Deliberete Tonal Changes. the Use of the Extensions. 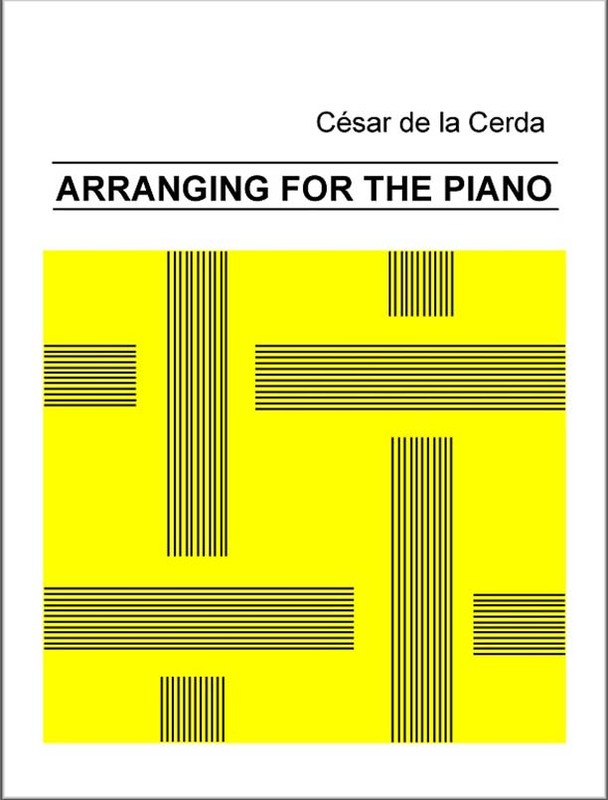 ARRANGING FOR THE PIANO by Dr. Cesar de la Cerda is an excellent resource for piano players (professionals or students), composers and piano arrangers that want to be more creative in the piano. The book will show the procedures of structural resources that allow the ability to convert a melody and its chords into a piano composition, regardless of the genre. The elements necessary as a starting point for the creation of an arrangement are simple. They only consist of one pure melody line, a set of chords accompanying it, and a time signature or conventional time measure, simply put: melody, harmony and rhythm. Based on an original theme whose notation means are only a melody on the treble clef, chord symbols and a fraction indicating the rhythm, the arranger goes on to its transformation into a free piano piece or composition. The resources used to this end are the arrangement techniques whose detailed description is the main content of this book. Every arranger or composer needs to constantly perfect the execution skills, increase and renew his or her expression resources and develop his or her fantasy and creativity so that a personal style evolves. With these piano techniques, you will be able to achieve the main tasks: transforming a simple melody and few chords into a piano composition. The Chapters of this book follow a gradual development. We start going from relatively simple techniques, to others of greater complexity. However, the student should feel free to proceed and choose selectively the training sequence regarding the techniques without having to follow one predetermined order. All the composition procedures explained in the book, even though they can be combined in different ways in practice, are independent from each other and can be studied in isolated form. Every technique is followed by practical exercises. Their objective is to perfect the technical performance. Such exercises will make it possible for the student to reach in a relatively short period of time, the understanding and efficient command of the set of techniques included in “Arranging for the Piano”. The method uses the Juilliard School of music system. Simple Bass Technique; Application Problems; Execution; Practice. “CROSS HAND” ARPEGGIO: Procedure; Variations; Execution; Practice. CHORDS IN AXIS POSITION: Procedure; Variations; Practice. ARTIFICIAL CHORDS: Procedure; Practical Application; Practice. HARMONIC DISTORTION: Harmonic Distortion Forms; Practice. WALKING BASS LINE: Procedure; Practical Considerations; Practice. APPENDIX II: TABLE OF “CROSS HAND” ARPEGGIOS. 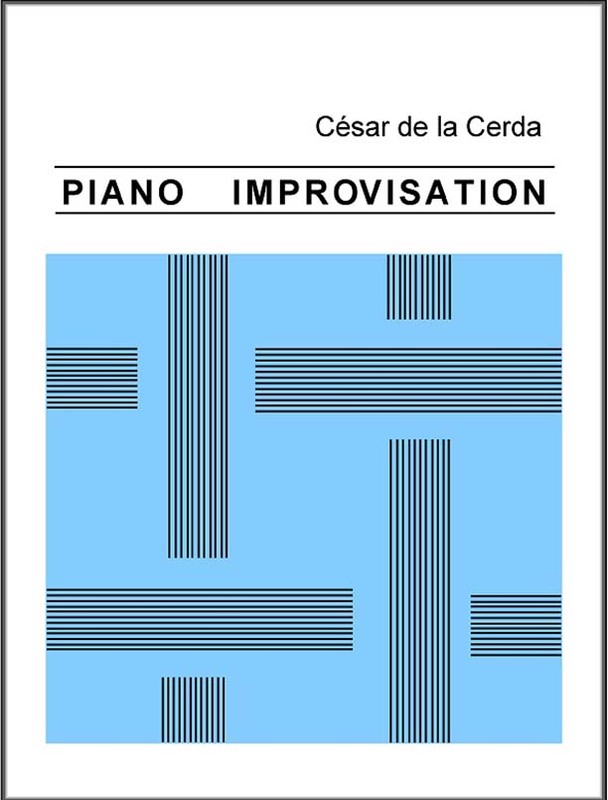 PIANO IMPROVISATION by Dr. Cesar de la Cerda is a unique method that will help you with the harmonies and associated scales and it will facilitate you the free expression of your creativity. Improvisation is the art of creating music spontaneously when one is playing on an instrument. Its realization depends both on the technical skills as well as on the fantasy of the player. However, it is in the latter -i.e. in the spontaneous natural creativity-, where its true foundation lies. Improvisation, which can be created based on a given theme or depend only on the inventive imagination, has been present in musical practice since almost ancient times. However, in the 20th century, the improvisation got a leading role in jazz music and two forms emerged: on the one hand, the main melody was freely modified in its tonal, harmonic or hythmic aspects, by distorting its original version, but maintaining it recognizable (known as paraphrase”), and on the other, where one does without the melody using only its chords, giving place to a new and original musical expression (“chorus”). The achievement of this latter form of improvisation, having the piano as a basic instrument, is the main focus of this theoretical and practical instructional material. Its practice is not limited exclusively to jazz music, but it can be applied to other music types, and in any form of free musical expression requiring it. The PIANO IMPROVISATION book will give you the impact you need to free yourself improvising in the piano. The book has many exercises and tips that will help you in an easy and modern way with the improvisation. THE ELEMENTS: Notes of the Chords; Scales Associated to the Chords.